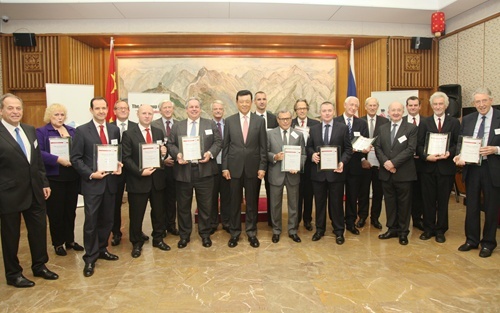 On the evening of October 22, the Annual Icebreaker Award Reception was jointly held by the Chinese Embassy in the UK and the 48 Group Club at the Chinese Embassy. 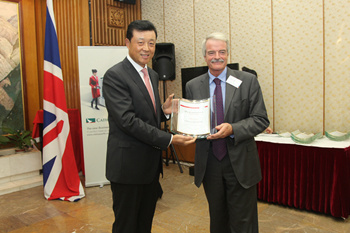 Nearly 200 people from the British government, parliament, military, industry, commerce, education and media sectors attended the Reception, including Former British deputy prime ministers Lord Geoffrey Howe and Lord Prescott, former Chief of the Defence Staff Admiral Michael Cecil Boyce, special advisor to Foreign Secretary Lord Howell, Chairman of China-Britain Business Council Lord Sassoon, British Consul General of Guangzhou Alastair Morgan, British Consul General of Shanghai Brian Davidson and Chairman Stephen Perry of the 48 Group Club. In his speech, Ambassador Liu Xiaoming mentioned how six decades ago, a group of British business leaders, after overcoming many obstacles, visited China and opened the door of commercial relations between the UK and the People’s Republic of China. It was called “an icebreaking trip”. Not long ago, Chancellor Osborne led a delegation to China and co-chaired the fifth China-UK Economic and Financial Dialogue with Chinese Vice Premier Mr. Ma Kai. Some British media called his visit to China “an ice melting trip”. His visit not only symbolized the recovery and but advance of China-UK relations. Through this visit, our two countries reached a series of important agreements. The meetings produced a raft of tangible outcomes in promoting trade and investment, enhancing financial cooperation and strengthening macroeconomic policy coordination. Comparing the ‘ice breaking’ mission 60 years ago with the recent ‘ice melting’ trip, Ambassador Liu pointed out that there will always be some ‘ice’ between the two countries. But in today’s China-UK relations, positive elements have become the mainstream and cooperation is the compelling consensus. The key to breaking and melting the “ice” between China and Britain is for both sides to commit to the spirit of mutual respect, equality and mutual benefit, and give top priority to the common interests of the two countries. Ambassador Liu pointed out that China and the UK should seize the new opportunities in bilateral relations, work in the “icebreaker” spirit and act with “ice melting” wisdom. We should aim to reduce obstacles and build up positive energy in our relations. He hoped that more visionary members of the 48 Group Club will carry on the “Icebreaker” spirit and dedicate themselves to cooperative cause of China-UK friendship. 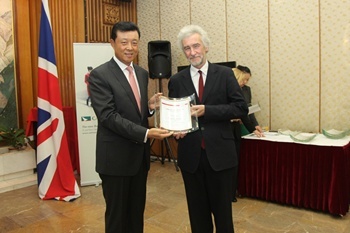 Chairman of the 48 Group Club, Stephen Perry expressed his heartfelt thanks for the assistance provided by the Chinese Embassy in hosting again the Icebreaker Award Reception and for Ambassador Liu’s speech. He also highly praised the personages of all circles that have long engaged in the friendly relations between the UK and China. Perry said that the tremendous progress made in UK-China relations in the past more than 60 years did not take place accidentally. It was the result of the concerted efforts and solid work of both sides. Currently, UK-China relations are about to enter a brand new era. 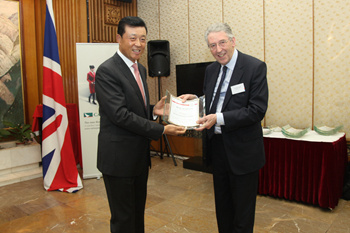 He hopes that more people may make new and greater contributions to the development of UK-China relations under the encouragement of the “Icebreaker” spirit. 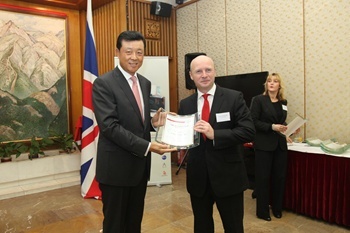 Lord Howell, special advisor to Foreign Secretary and representative of the winners of “Icebreaker” awards said in his speech that the UK should face the future and constantly strengthen the friendly cooperation with China and other emerging countries. UK-China cooperation is of utmost importance to the development and prosperity of the two countries. He hoped that the two sides may constantly make new progress in economy, trade, science and technology, new energy and other sectors and bring new vitality to the development of the bilateral relations. 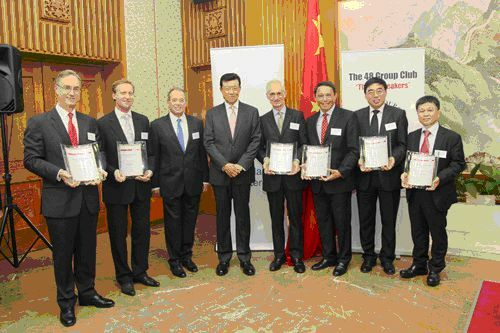 At the Reception, Ambassador Liu presented awards to winners of the Fellowships and Honorary Memberships awards of the 48 Group Club. Ambassador Liu and guests present were also interviewed by Xinhua News Agency, People’s Daily, CCTV, China Radio International, China News Service and Phoenix TV.